A photo of Ann Curthoys from her student days fascinates me. 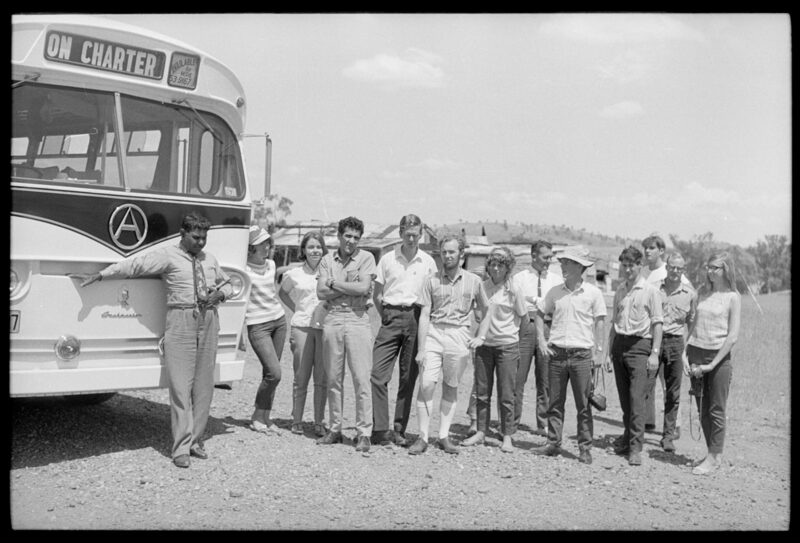 She is standing next to a bus with her fellow students and comrades from ‘Student Action for Aborigines’ (SAFA). It is not a particularly eventful moment to capture, yet the innocuous nature of this snapshot is exactly what draws me in. This is the first glance I have of esteemed activists as ‘normal’ students. The photo is from 1965, but it is before the Freedom Rides gain traction and notoriety around the world. It dawns on me these renowned activists were students, and many of them were the age I am now. Interested in what has changed and what remains the same, I decide to speak with Ann. Ann’s upbringing was undeniably central to the activist spirit she brought to USyd’s campus. Both her parents “were members of the Communist Party of Australia” and she recalls activists “often visiting [her] house”. As a child, she attended Eureka Camps where she socialised with other communist offspring. She would later join the Eureka Youth League, a political organisation. Although she grew up in Newcastle, Ann was able to “maintain connections to Sydney” through these youth political groups. In 1963 she eventually decided to study at the University of Sydney. She chuckles as she recalls being motivated by a desire “not to attend a university where [her] father was an academic”. Although she never aspired to enter parliamentary politics, Ann took after her parents by becoming a member of the communist party in the early stages of her degree. However, after being in the party for less than two years, she decided to leave “over issues of democracy…influenced by the rise of the new left.” As she continued her degree, Ann became part of other interesting activist movements. In those days, activist meetings were “quite formal”, with “presidents and secretaries”. This is contrary to the proudly ‘functional degenerate’ branding of modern campus activists. She recalls the distinctive influence of the Vietnam War in “shifting students to the left” as they began engaging in “the burning of draft cards, anti-conscription demonstrations… and more expressive politics”. Curious about student life beyond activism, I ask Ann about the campus sub-cultures during her time. One notable feature was the commemoration day celebrations, which I have often found referenced in old editions of Honi but never quite understood. “It was quite a big thing,” she says, “from the name I presume it was celebrating the beginning of the university…it did have a parade through town-when I think about it, that’s quite extraordinary.” I find there to be something quite charming about the image of student larrikins parading through town—a wholesome but quirky university tradition that reflects a sense of affinity between students. When Ann compares those days to her most recent visits to the university she suggests “there’s been a huge change…the growth in the size of it has made it difficult to have a sense of it as a single institution.” Whilst there were divisions on campus during her own time, she seems to feel as if the university’s expansion has caused a greater disconnect between students. Of course, the other forthcoming difference was the changes in the diversity of campus. When reminiscing on her particularly meaningful friendships with fellow female students, Ann remembers the bonds formed over “shared experiences of going through the challenges of university life and developing careers”. I decide to conclude by asking Ann what her fondest memory of campus life is. “Thats a tough one”, she says as she reflects on her numerous recollections from university days. “I really find it hard to answer. In some ways it was enjoying the academic side of things. In some ways it’s just making good friends…but it has to be the student engagement. It was important looking back.” As our interview reaches its end, I start wondering what my reflections on campus will be like in 50 years time. I sincerely hope I can look back at my time at USyd as fondly as Ann seems to.